If you're producing technical content that can be recorded as Continuing Professional Development (CPD) activities, you can assign CPD values to it in Velpic. Select the checkbox for Continuing Professional Development to enable CPD features for your account. 3. Enter the name of the CPD value for your organisation, some call it CPD Hours, others points. 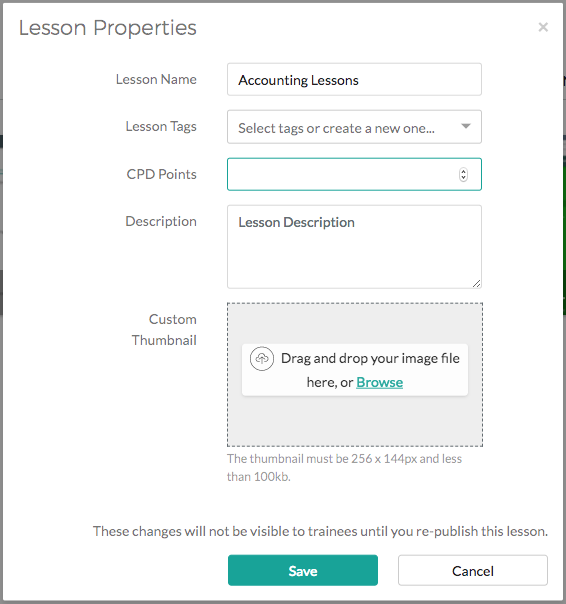 CPD values for lessons will now appear on relevant Lessons lists and Results lists, and will also appear on certificates that are generated from Velpic. Create a new module lesson, or edit an existing one. 2. When editing a lesson, click the 'Edit icon' next to the lesson name to open the Lesson Properties dialog box. 3. Enter the CPD value for the lesson and click Save.